Crab Island Cruises Are Here! Crab Island Days are Here – let us take you! SunQuest Cruises is pleased to announce that the SunVenture I Catamaran is kicking off the summer with additional cruise options from the Destin Harbor. The Coast-Guard licensed captains of the SunVenture I are now cruising seven days a week for Crab Island Excursions and Dolphin /Sunset Cruises. In addition, the SunVenture I is extending a new Destin Harbor Fireworks Cruise every Thursday evening for adults only. The 45-foot, Guy Harvey-inspired SunVenture I Catamaran offers a variety of memorable experiences on the water, with the Crab Island excursions being the most popular. Cruising daily at 12 p.m., the SunVenture I ‘ventures’ out for three-hour excursions to the world famous Crab Island. Guests enjoy a stress-free day as the Coast Guard licensed captains handle all the driving and drop anchor at the center of all the fun. Crab Island is an underwater playground with a shallow sandbar that offers an experience like no other, including relaxing in the waist-deep waters, live music, inflatable slides, paddle boarding and more. Rest rooms are available on-board the SunVenture I as well as shaded areas and paddleboard / kayak rentals. Every Thursday in June at 7:30 p.m., the SunVenture I is reserved for adults seeking a magical and serene evening on the water with a Destin Harbor Fireworks cruise. This one and a half hour cruise explores the Destin Harbor at sunset and offers guests the best seat in the house for fireworks as the sky above them illuminates with bright colors. The close proximity to the water and open-air deck offers SunVenture I guests the closest views of the dolphins on an hour and half educational sunset cruise. Cruising daily at 6:30 p.m., the eco-cruise begins with a narrated tour of the iconic Destin Harbor by the entertaining SunVenture I captains. Guests will cruise into the sunset, learn about the area’s history and enjoy dolphin sightings in the beautiful, emerald green waters of the Gulf of Mexico. The SunVenture I is also available for private charters for up to 49 people. Guests can rent the boat and the captain for any occasion, including brunches, birthday parties, bachelor/bachelorette parties, corporate retreats and more. The state-of-the-art sound system and open deck arrangement offers a memorable celebration on the water. Event planners and catering packages are also available. The SunVenture I is located at 314 Harbor Blvd in Destin Florida, one mile east of the Destin Bridge at Heron Harbor. For additional information, including cruise videos, schedules and online reservations, visit www.SunVentureCruises.com or call 850.424.6465. Founded in 2004, SunQuest Cruises is a locally-owned and operated company in Miramar Beach, Florida. The company features two distinct cruise experiences. Docked at Sandestin, the 125 foot, three deck SOLARIS is the only dining and entertainment yacht in Northwest Florida, featuring weekly dinner sunset cruises as well as weddings for up to 150 guests. The SunVenture I Catamaran is a 45-foot leisure cruise option docked at the Destin Harbor, offering daily Dolphin, Crab Island and Fireworks cruises for up to 49 guests. For more information, visit www.SunQuestCruises.com or call 850.650.2519. The SunVenture I Catamaran joined the SunQuest Cruises family in 2012 as a leisure option for Dolphin, Crab Island and Fireworks cruises. Docked at the Destin Harbor, the custom-built vessel is a water lover’s 45-foot sporty catamaran, featuring sea-inspired Guy Harvey artwork. The SunVenture I offers a state-of-the-art sound system and an open air deck for leisure and private cruises for up to 49 people. 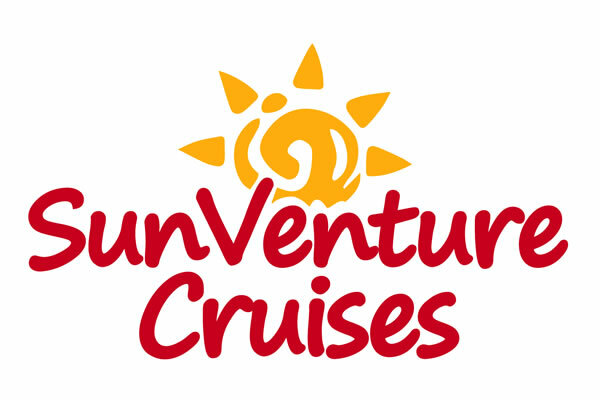 For additional information, including schedules, cruise videos and online reservations, visit www.SunVentureCruises.com or call850.424.6465. Docked at the Destin Harbor, the SunVenture I Catamaran now offers Crab Island Excursions and Dolphin/Sunset Cruises seven days a week as well as weekly, adults-only Harbor Fireworks Cruises.